Hanoi (VNA) – Deputy Prime Minister Truong Hoa Binh highly valued the support of the Republic of Korea (RoK) Government and people to Vietnam’s national reform and development, including legal and judicial reforms, while meeting with RoK Chief Justice Yang Sung-tae in Hanoi on August 28. He thanked the RoK for assisting the implementation of a project to strengthen capacity of the School for Court Officials, which is now the Vietnam Court Academy, contributing to improving the quality and effectiveness of judicial training in the country. The Deputy PM expressed hope to learn more from the RoK Supreme Court’s experience in developing the electronic legal procedure model as well as the establishment of an Invention Court and courts for families and adolescents. 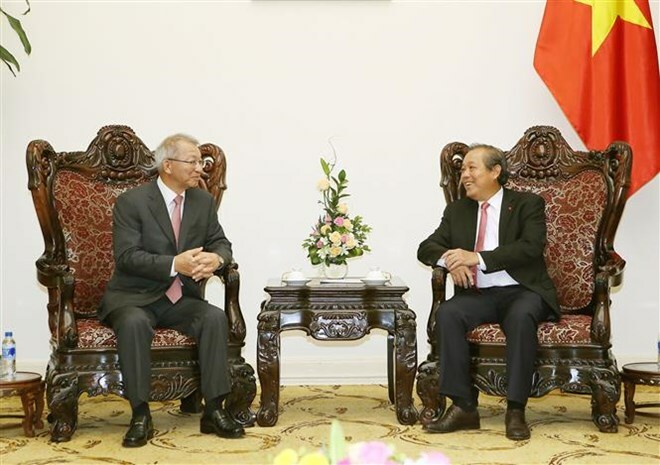 He affirmed the support of the Vietnamese Government for the further enhancement of cooperation between the Supreme People’s Court of Vietnam (SPCV) and RoK partners, including the Supreme Court and the Korean International Cooperation Agency (KOICA). He also askedSPCV and KOICAto soon launch a project to improve the transparency and judgmentquality of courts in Vietnam. For his part, Yang Sung-tae said that he is pleased to be the first RoK Chief Justice to visit Vietnam when the two countries are celebrating the 25th anniversary of bilateral diplomatic ties.